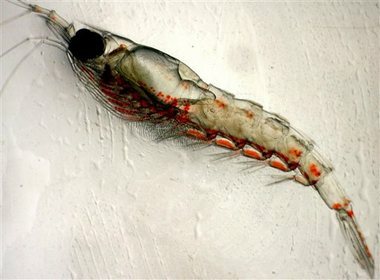 GRANTS PASS — Millions of krill— a tiny shrimp-like animal that is a cornerstone of the ocean food web — have been washing up on beaches in southern Oregon and Northern California for the past few weeks. Scientists are not sure why. National Oceanic and Atmospheric Administrationoceanographer Bill Peterson says they may have been blown into the surf by strong winds while mating near the surface, and then been dashed on the beach. The species is Thysanoessa spinifera. They are about an inch long and live in shallower water along the Continental Shelf. They have been seen in swaths 5 feet wide, stretching for miles on beaches from Eureka, Calif., to Newport, Ore. Some were still alive. Or, they may have fallen victim to low levels of oxygen in the water, said Joe Tyburczy, a scientist with California Sea Grant Extension in Eureka. A recent ocean survey showed lower than normal oxygen levels in some locations. If the krill went to the surface to get oxygen, they could have been blown on shore, he said. For some reason, people did not see gulls and other sea birds eating them, he added. Peterson said low oxygen conditions, known as hypoxia, are a less likely explanation because they normally occur later in the summer. The mass strandings are unusual, but not unheard of, Peterson added. There is no way to tell yet whether this represents a significant threat to a source of food for salmon, rockfish, ling cod and even whales. This entry was posted in Environment, News and tagged California, environment, Krill, NOAA, Oregon by admin. Bookmark the permalink.